Crossflow industrial scrubbers maintain stack emissions to specific ppm levels for all input concentrations. Specific outlet requirements based on percent removal can also be guaranteed. Key to the performance of this system is high liquid flow recirculation, which provides intense contact between the contaminant and scrubbing liquid. Three system configurations are available, each with capacities to 100,000 CFM and higher. Ultra-Scrub Crossflow is a version of the industrial scrubber that operates with full redundancy for critical system modules, for zero production downtime. Back-up readiness is assured through regular programmed hand-over from primary systems. This feature significantly reduces monitoring and maintenance requirements, and assures full operation, even during equipment maintenance. Crossflow scrubbers are supplied with control panels and operator interface. Standard construction material is UV stabilized polypropylene; PVC and stainless steel are available. Crossflow scrubbers use Tri-Packs tower packing and high-efficiency industrial mist eliminators. 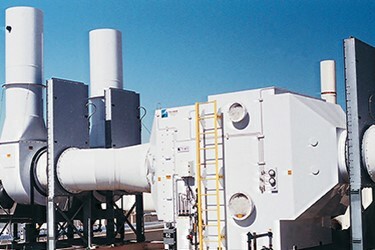 Quench-equipped systems accommodate inlet temperatures to 2000°F. Applications include a broad range of manufacturing and process industries; semiconductor, metal finishing, and chemical industries generating corrosive fumes and gases also benefit from Crossflow technology. Velocity translates into residence time. Residence requirements in the system varies from ½ second to several seconds. This variable is specified by Tri-Mer engineering based on the application. For a specific removal efficiency, it is necessary to define input vs. output. This number is expressed as mass emission per hour in vs. out. Volumetric expressions, including ppmv, are also appropriate. The gas flow through the scrubber system, expressed in cu. ft/min. (cfm), is an important factor in the design of the scrubber vessel. Since residence time in the scrubber is a critical design consideration, the volume of air passing through the scrubber directly affects the cross sectional area. Most metal finishing applications operate under 100°F inlet temperature. Tri-Mer Crossflow Systems accommodate inlet temperatures from ambient to over 2000°F. High temperature systems require a gas quench, integral to the system. Understanding gas stream variables, which include residuals riding in the gas stream in addition to the primary contaminant to be removed, is crucial. Residuals may not be of primary interest from the standpoint of removal efficiency, but could affect system chemistry, or, if particulates are involved, may restrict flow if not accommodated. Blow-down rates are determined by the chemistry within the scrubber. Systems requiring low ppb outputs require higher water blow-down capacities than systems operating higher output dynamics. Specific multi-stage systems may require multiple blow-down points to a final treatment tank. This ratio is determined by the factors discussed earlier. System removal requirements play an important role. Tri-Mer engineering will be responsible for calculations.